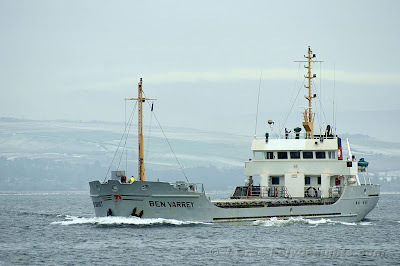 The attractive little coaster BEN VARREY, belonging to the Ramsey Steamship Company, was seen passing Greenock after having discharged a cargo of animal feed, loaded at Belfast, at Shieldhall. BEN VARREY was built in 1986 at Hoogezand in The Netherlands as TRIUMPH, and has a deadweight of 1,546 tonnes. She is 63.8 metres overall, and was heading back to Belfast. She has been a member of the Isle of Man based fleet since 1999.